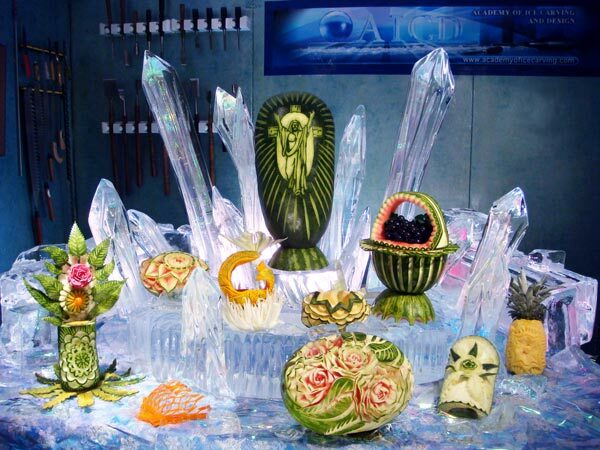 This instructional program provides a hands-on, one-to-one, crash course of private instruction in the most critical aspects of combining custom designed ice carvings, Thai fruit carvings, and Thai vegetable carvings into dramatic centerpieces and functional food displays. An emphasis is placed on safe carving and set-up techniques. This course is customized to your needs as an Executive, Sous, or Garde Manger Chef, and is taught exclusively by Paul Germain. We invite you to call Paul personally for more information. Note: This course of private instruction has been developed for Executive Chefs and Garde Mangers. However, in certain circumstances, the requirement for having this level of culinary experience may be waived upon written recommendation from an Executive Chef. Instruction includes many of the carving tips, tricks, and tools from our Food Artist and Chef Ice Carver programs and incorporates them as practical designs and skills that chefs need for important seasonal holiday presentations and other special occasions. The emphasis of the Food and Ice Artist program is to combine these elements with functional ice sculpture designs to create even more gorgeous and dramatic presentations. is like being in fruit and vegetable heaven! AICD's programs of private instruction are available year-round. Private instruction is tailored to your needs and experience. No previous experience is required for this program. AICD's comprehensive two day (30 hours, including 10 hours of art related homework in preparation for the next day's instruction) Certified Food and Ice Artist (CFIA) Program of private instruction is especially designed for chefs, and garde mangers who need the professional and competitive know-how for designing and carving ice sculptures and food carvings for dramatic and functional presentations. This intensive three-day program will equip you with the most critical techniques and course requirements from our three-day Certified Professional Ice Carver (CPIC) Program. 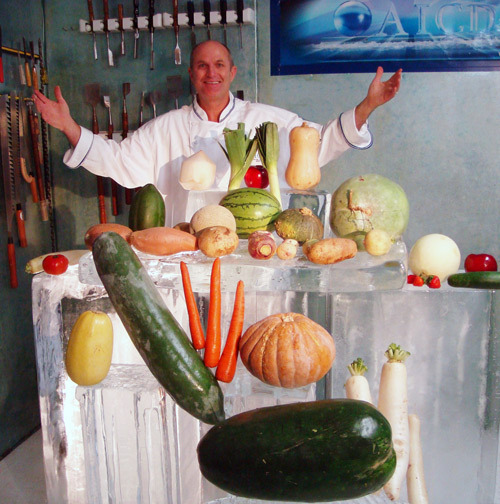 Through intensive hands-on lessons, Paul Germain's unique and rigorous training system will give you confidence in creating ice carvings, fruit carvings, and vegetable carvings. AICD's Adjunct instructors are world renown fruit and vegetable carvers Chef Ray Duey and Jimmy Zhang. "Mr. Germain is at the top of his field and I wanted to learn from the best. I like that it was an all inclusive course that he tailored to my schedule. The classes are very interactive. The instructor is a master of his craft. The hospitality is very inviting and friendly, and the training is professional, safe, understandable, challenging, and creatively inspiring. Above all, it was fun! " are available year-round in our custom studio. The savings in time, tuition, meals, and lodging make our Certified Food and Ice Artist Program (CFIA) the most popular program of choice for companies who wish to offer immediate instruction for their chefs and garde mangers. Our goal is bold: to make it possible for you to gain a greater overview of professional ice carving and food carving through hands-on experience than has ever been possible in such a short period of time! Special Note: AICD provides one-to-one personalized instruction that is tailored for each student's experience and future objectives. Private instruction ensures that student carvers of any level receive far more actual training and individual guidance than is possible within group ice and food carving classes. It also provides a much safer and more productive learning environment for developing the skills needed for selling and safely setting up highly realistic and creative multi-block ice sculptures. The most important and innovative techniques of professional ice carving, Thai fruit carving, and Thai vegetable carving have been condensed into a single 30 hour program. Due to the fast-paced intensity of this custom program, it is best suited for private instruction of students who are capable of optimum concentration and physical stamina. Our unique program includes hands-on training in many of the highly specialized tools and "secret ice carving techniques" developed throughout Paul's 25 years of experience in the ice sculpting industry, as well as many of the most advanced and celebrated techniques used by professional ice sculptors around the world today. In addition to providing students the opportunity to use a huge selection of ice carving and design tools, a complete library of ice carving books is available. Paul Germain has been collecting ice carving books since he first started carving ice sculptures over 35 years ago. The AICD library is second to none, featuring 30 of the most artistic and creative ice carving books that have ever been published - many of which are no longer being printed. Students have the rare opportunity to view and be inspired by the incredible ice sculptures in these rare editions in the comfort of the AICD studio or at their hotel. Also, a complete library of fruit and vegetable carving books is available. Paul Germain has been collecting fruit and vegetable carving books since he first started training as a Garde Manger Chef over 35 years ago. The AICD library is filled with 30 of the most artistic and creative fruit and vegetable carving books that have ever been published. In addition to providing students the opportunity to use a huge selection of ice carving and design tools, a complete library of fruit and vegetable carving books is available. Paul Germain has been collecting fruit and vegetable carving books since he first started training as a Garde Manger Chef over 35 years ago. The AICD library is filled with 30 of the most artistic and creative fruit and vegetable carving books that have ever been published. AICD's Certified Food and Ice Artist (CFIA) Program in Fresno, California is ideally suited for any culinary school, hotel, country club, caterer, or restaurant that is in need of immediate ice sculpture instruction and Thai food carving training for the sake of increasing sales and managing the safe setup of ice and food sculptures. The AICD Certified Food and Ice Artist (CFIA) Program includes three days (30 hours including art related homework in preparation for the next day's instruction) of intensive, hands-on, private ice carving instruction. Course topics from our Certified Professional Ice Carver (CPIC) Program have also been adapted to help chefs and garge mangers to gain the essential skills needed to manage the creation and safe display of dramatic buffet sculptures. Our private, one-on-one instruction is available for highly motivated carvers who want to advance at a rate that is optimum for their learning style, skill, and level of experience. Private instruction is adapted to suit the individual sales person's needs. 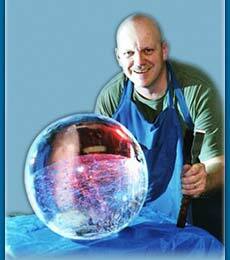 The ice carving and food carving industry is growing at a phenomenal rate in Fresno, the U.S and around the world. AICD is dedicated to providing the most comprehensive ice sculpture training, fruit carving training, and vegetable carving training possible for ice sculpture companies, hotels, caterers, country clubs, and culinary schools seeking to employ highly qualified, professionally certificated chefs, garde mangers, and ice carvers.